The Steamboat Springs area was a summer camping spot for the Ute or Nuchu tribe, nomadic hunter-gatherers who roamed the Western Slope starting in 1000 A.D. The Utes also used natural springs in the area for medicinal purposes. Trappers began exploring in the Steamboat area in the early 1800s and called the area Big Bend because the Yampa River makes a turn toward the west there. The name Steamboat Springs is thought to have originated with some French trappers who thought they heard the chugging sound of a steamboat in what turned out to be the gurgling of a natural spring, one of 150 in the area. Traces of gold were discovered on Willow Creek’s headwaters north of Steamboat Springs in 1862, but the field was not developed until the 1870s, notably at Hahn’s Peak, and it eventually produced just $500,000 worth of gold. Rancher James Crawford and some friends arrived in the Steamboat area in 1874 from Hot Sulphur Springs, where Crawford had built the first permanent home. Crawford liked the springs he found on the bend in the Yampa River and staked his homestead claim in what would become Steamboat Springs. He built a small wood cabin in 1875 and a more permanent one in 1876. The Crawfords were the only white family in the area, and they befriended the Utes and traded with them, fed them, and tended to their medical needs. The Utes were forced to leave most of the Western Slope after the Meeker Massacre, in which a dispute between U.S. Indian Agent Nathan Meeker and band of Utes prompted the Utes to attack the White River Indian Agency, killing Meeker and 11 male employees in 1879. The agency was located three miles west of the modern-day town of Meeker, which is 90 southwest of Steamboat Springs and was named for the Indian agent. The opening of the Suttle sawmill in 1883 spurred growth in the Steamboat area, and Crawford organized the Steamboat Springs Town Co. in 1884 with the financial backing of several investors from Boulder. The company laid out the town, sold lots, and built a bathhouse over one of the hot springs. Other settlers began to move into the area, which got its first post office, school, church, library, and newspaper. The town of Steamboat Springs was incorporated in 1900, with Crawford as the first mayor. Half of the original townsite was on Crawford’s homestead. Cattle ranching was the area’s largest industry in the area until the 1920s. Investor David Moffitt, however, was working on plans for the Denver, Northwestern & Pacific Railway, also known as Moffat Road. He had started the railroad from Denver in 1903 and was able to Steamboat Springs in 1908 by crossing Rollins Pass. The railroad boosted Steamboat’s position as a commercial center for the area’s ranches and coal mines, though it destroyed the springs that had given the town its name. More than 70 coal mines, both surface and underground, worked the Yampa field starting in the early 1900s. The field stretched across Rout, Moffatt, and Rio Blanco counties. The arrival of the railroad and the completion of the Victory Highway into Steamboat after World War I opened the area to tourism. The highway became U.S. 40 and opened to year-round travel in 1935, with the hot springs, hunting, and fishing drawing visitors. Steamboat Springs replaced Hahn’s Peak as the Routt County seat in 1912, two years after a fire destroyed most of Hahn’s Peak. In 1913, Carl Howelsen, a Norwegian Nordic skier, moved to town and introduced ski jumping. A year later, Howelsen built a first jump on namesake Howelsen Hill, which is now part of the city-run Howelsen Ski Area and the oldest ski area still operating in Colorado. Howelsen also founded the annual Winter Carnival with ski racing and jumping and dog sledding on the hill and chariot events down Lincoln Avenue, the town’s main street. The carnival added a nighttime show with torchlight parades, fireworks, and ski jumping through a fiery hoop in 1935 and two years later introduced the Lighted Man, who skis down the hill wearing a suit with 200 light bulbs and shooting off Roman candles. The Steamboat ski area was created on Storm Mountain east of town by Jim Temple, the son of a local rancher who had worked on the ski patrol at Sun Valley, Idaho. Temple started with a few trails in 1958 and added a Pomalift in 1961 and a double chairlift in 1963, which is used by the resort as its official opening date. Storm Mountain got a new name, Mount Werner, in 1965 to honor local ski racer Wallace “Buddy” Werner, who was killed by an avalanche in 1964 while filming a movie in Switzerland. Steamboat has steadily expanded over the years, turning into one of Colorado’s major ski resorts. The railroad stopped carrying passengers in 1968 and cattle in 1976 as other modes of transportation became more popular. But Steamboat continued to thrive as a ranching center and ski resort city, with a strong tourism business in the spring, summer, and fall from fishing, hunting, mountain biking, rafting, kayaking, and other outdoor sports. In 1974, The Industrial Company was started in Steamboat Springs. It has grown into one of the largest industrial construction companies in the United States with revenues of approximately $2 billion and more than 9,000 employees worldwide. Steamboat also has always had a streak of offbeat humor. In 1993, residents voted overwhelmingly in a poll to give a new bridge across the Yampa River the name “James Brown Soul Center of the Universe Bridge” even though the soul singer had no local ties. Brown attended the ribbon-cutting ceremony for the structure. Also, the Rabbit Ears Motel sign that has greeted motorists arriving from Rabbit Ears Pass since 1953 achieved historic designation in 2006. The sign is topped by a cartoonish, smiling rabbit head that’s 7-feet, 6-inches from the bottom of the chin to the top of the ears. 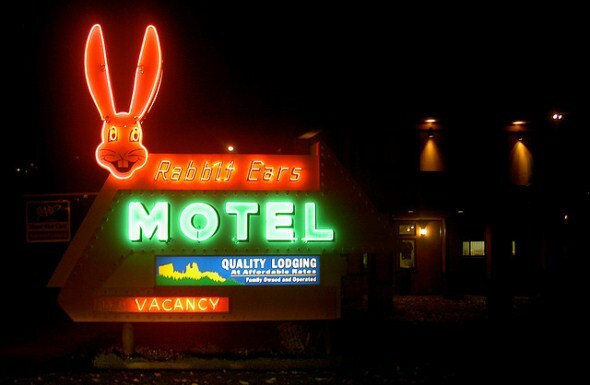 The neon tubes around the rabbit’s face glow in pink when lit, with the words “Rabbit Ears” and “Vacancy” in orange neon and the word “Motel” in green neon. Tourism is a major industry, but Steamboat also continues to serve as a center for cattle and sheep ranching, hay and wheat farming, and coal mining.